Introduce yourself as Celes, or if the song you're singing has spoken parts that works as well. Delighted to meet you. My name is Celestia Ludenberg--My real name? Heh heh... Im afraid I cant give you that. Celestia Ludenberg is the name I go by. Its a little troubling for us. Spending the rest of our lives in this school Oh, your heart really is made out of stone. I hope your body at least gets some good minerals out of it. I'm rather proud of my ability to tell lies. I can trick not only others; but even my own heart. 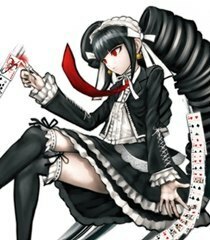 My name is Celestia Ludenberg, but you can just call me Celes. It is my name, the name I go by. We must just learn to adapt to our situation. (angered) WHAT KIND OF STUPID NAME IS TAEKO YASUHIRO? THATS A LOSERS NAME! I'M NO LOSER! I only drink royal milk tea, in which milk is used to draw out the flavor of the black tea. Just bring me my damn tea already, Porky!! Ufufu...I see that you desperately want to set me up as the culprit here, but... You're a fool! You're sorely, SORELY mistaken! !